Jordan Brand had his motorcycle racing team design a couple pairs of Jordans, which one of the pairs are the Air Jordan Retro 4 (IV) Lightning. Not only did you get the Air Jordan 4 Retro Lightnings, but a matching T-Shirt. The Online Only release set a lot of collectors mad, for one the availability was small, but was priced high at $250. 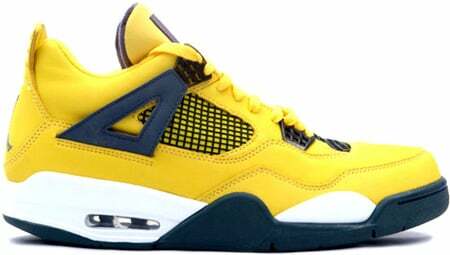 Prices have fluctuated for the Air Jordan Retro IV (4) Lightning that contains a Tour Yellow/Dark Blue-Grey-White color scheme. Release date was August 23rd 2008.